Categories: Featured, Sierra Nevada. Tags: granada, sierra nevada, Ski. SIERRA NEVADA – Powder snow crunching beneath your feet, sun warming your face, kamikaze snowboarders flying through the air… nowhere on the Iberian peninsula are perfect skiing conditions such a safe bet as in the Sierra Nevada. Christmas card views, adrenaline-pumping thrills and cloudless skies for catching an out-of-season suntan – the resort sometimes nicknamed the ‘Costa del Ski’ has it all! Know your piste colour codes. Jon Clarke on the terrors of trying to teach your own children how to ski. 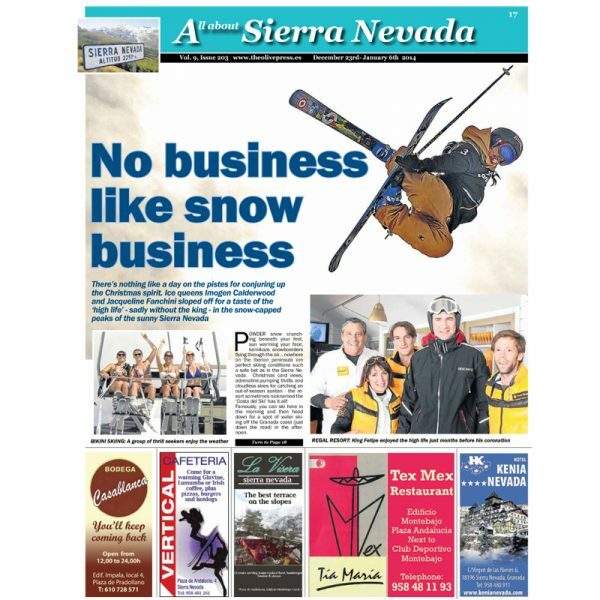 Boss of the Sierra Nevada’s biggest skiing school EOE Juan Luis Hernandez recalls his early days on the slopes. Sierra Nevada has one of the best mixes of quality restaurants in Andalucia, writes Jon Clarke. British ski teachers Giles Birch and Jonathan Buzzard still love the Sierra Nevada two decades on. Not certain about skiing? Why not take a mountain adventure with Telemark ski school instead. Slip-sliding… to sleep. Everything from modern to traditional and from cheap to luxury.